The face of American forests is changing, thanks to climate change-induced shifts in rainfall and temperature that are causing shifts in the abundance of numerous tree species, according to a new paper by University of Florida researchers. The result means some forests in the eastern U.S. are already starting to look different, but more important, it means the ability of those forests to soak up carbon is being altered as well, which could in turn bring about further climate change. Human-caused climate change will drive more extreme summer heat waves in the western U.S., including in California and the Southwest as early as 2020, new research shows. The new analysis of heat wave patterns across the U.S., led by scientists at the University of Miami Rosenstiel School of Marine and Atmospheric Science (UM) based Cooperative Institute for Marine and Atmospheric Science (CIMAS) and colleagues, also found that man-made climate change will be a dominant driver for heat wave occurrences in the Great Lakes region by 2030, and in the Northern and Southern Plains by 2050 and 2070, respectively. Small-scale droughts can have big effects on the Florida Everglades. 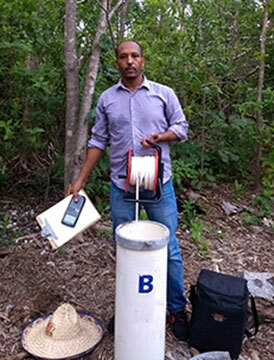 Ph.D. student Anteneh Abiy is digging deep into these abnormally low rainfall events. He doesn't have to do go too far into weather data to begin his work. 2017 was drier than usual. The Everglades received 6 inches of rainfall less than the annual average. "Drought is a cancer. Its effects creep up little by little and you don't notice them until it's too late," Abiy said. "You can't predict when drought will happen. But, with the right information, you can design sound strategies to better store water in the Everglades, manage our water supply and take action immediately." Seagrasses in Shark Bay, Australia released massive amounts of carbon dioxide after a devastating heat wave killed them, according to a new study. More than 22 percent of Shark Bay's seagrasses died when water temperatures warmed as much as 7 degrees Fahrenheit above normal for more than two months in 2011. Up to 9 million metric tons of carbon dioxide were released - the equivalent of what is released annually by 800,000 homes or 1.6 million cars. Healthy seagrass meadows act as giant reservoirs that store carbon in their soils, leaves and other organic matter. 100 Resilient Cities - Pioneered by The Rockefeller Foundation released " Safer and Stronger Cities," a series of policy recommendations for the federal government to help our nation's urban centers become more resilient in the face of 21st-century challenges. The report, which comes after cities faced an unprecedented series of short-term and long-term challenges in 2017, focuses its recommendations on infrastructure, housing, flood insurance, economic development, and public safety. Kristine Harper (FSU) has been awarded the 2017 Atmospheric Science Librarians International (ASLI) Choice Award (History) and the 2018 Florida Book Awards Bronze Medal -- General Non-Fiction for her book titled Make it Rain: State Control of the Atmosphere in Twentieth-Century America (University of Chicago Press, 2017). Sonia Stephens (UCF) & colleague D. P. Richards have received a $1,500 Career Advancement Research Grant from the ACM Special Interest Group on the Design of Communication for their project titled, "Story Mapping and Sea Level Rise: Bringing a Global Risk Home." Mark Hafen (USF) and colleagues have developed a sea level rise community engagement game, Atlantis: A Game of Sea Level Rise, as part of their NSF Smart &Connected Cities planning grant: "Agent-Based Scenario Planning for a Smart & Connected Community against Sea Level Rise in Tampa Bay." The collaborators demonstrated the game at the recent NSF Smart Cities Connect Conference. Florida's Climate: Changes, Variations, & Impacts provides a thorough review of the current state of research on Florida's climate, including physical climate benchmarks; climate prediction, projection, and attribution; and the impacts of climate and climate change on the people and natural resources in the state. The book is available for purchase in paperback and Kindle format at Amazon.com. Individual chapters may be accessed on the FCI website. Anandhi, A., & Kannan, N. (2018). Vulnerability assessment of water resources - Translating a theoretical concept to an operational framework using systems thinking approach in a changing climate: Case study in Ogallala Aquifer. Journal of Hydrology, 557, 460-474. Anfinson, K. (2018). How to tell the truth about climate change. Environmental Politics, 27(2), 209-227. Arias-Ortiz, A., Serrano, O., Masqué, P., ... Fourqurean, J. W., et al. (2018). 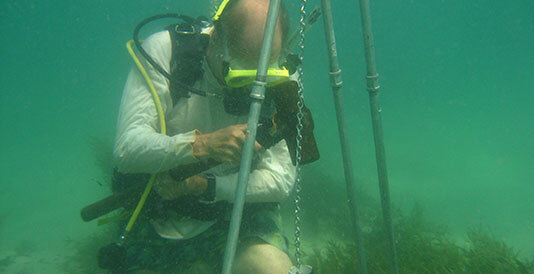 A marine heatwave drives massive losses from the world's largest seagrass carbon stocks. Nature Clim Change, 8(4), 338-344. Chan, F. C. C., Altaf Arain, M., Khomik, M., ... & Skubel, R. (2018). Carbon, water and energy exchange dynamics of a young pine plantation forest during the initial fourteen years of growth. Forest Ecology and Management, 410, 12-26. Chung, E. - S., & Soden, B. J. (2018). On the compensation between cloud feedback and cloud adjustment in climate models. Clim Dyn, 50(3-4), 1267-1276. Chutcharavan, P. M., Dutton, A., & Ellwood, M. J. (2018). Seawater 234 U/ 238 U recorded by modern and fossil corals. Geochimica et Cosmochimica Acta, 224, 1-17. Czajkowski, J., Engel, V., Martinez, C., Mirchi, A., Watkins, D., Sukop, M. C., et al. (2018). Economic impacts of urban flooding in South Florida: Potential consequences of managing groundwater to prevent salt water intrusion. Science of The Total Environment, 621, 465-478. D'Amato, A. W., Jokela, E. J., O'Hara, K. L., & Long, J. N. (2018). 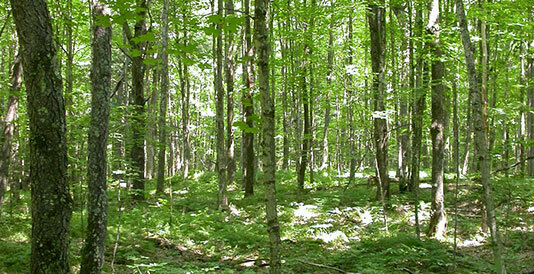 Silviculture in the United States: An Amazing Period of Change over the Past 30 Years. Journal of Forestry, 116(1), 55-67. Davidson, T. M., Altieri, A. H., Ruiz, G. M., Torchin, M. E., & Navarrete, S. (2018). Bioerosion in a changing world: a conceptual framework. Ecol Lett, 21(3), 422-438. DeLorme, D. E., Stephens, S. H., & Hagen, S. C. (2018). Transdisciplinary sea level rise risk communication and outreach strategies from stakeholder focus groups. J Environ Stud Sci, 8(1), 13-21. Dietze, M. C., Fox, A., Beck-Johnson, L. M., ... & White, E. P. (2018). Iterative near-term ecological forecasting: Needs, opportunities, and challenges. Proc Natl Acad Sci USA, 115(7), 1424-1432. Du, Y., Ramirez, C. E., & Jaffé, R. (2018). Fractionation of Dissolved Organic Matter by Co-Precipitation with Iron: Effects of Composition. Environ. Process., 5(1), 5-21. Faye, B., Webber, H., Naab, J. B., ... Hoogenboom, G., Boote, K., Shelia, V., et al. (2018). Impacts of 1.5 versus 2.0 °C on cereal yields in the West African Sudan Savanna. Environ. Res. Lett., 13(3), 034014. Fisher, R. A., Koven, C. D., Anderegg, W. R. L., ... Lichstein, J. W., ... Zhang, T., et al. (2018). Vegetation demographics in Earth System Models: A review of progress and priorities. Glob Change Biol, 24(1), 35-54. Getz, W. M., Marshall, C. R., Carlson, C. J., ... Ryan, S. J., et al. (2018). Making ecological models adequate. Ecol Lett, 21(2), 153-166. Gravinese, P. M. (2018). Ocean acidification impacts the embryonic development and hatching success of the Florida stone crab, Menippe mercenaria. Journal of Experimental Marine Biology and Ecology, 500, 140-146. Hua, W., Zhou, L., Chen, H., Nicholson, S. E., Jiang, Y., & Raghavendra, A. (2018). Understanding the Central Equatorial African long-term drought using AMIP-type simulations. Clim Dyn, 50(3-4), 1115-1128. Keellings, D., Bunting, E., & Engström, J. (2018). Spatiotemporal changes in the size and shape of heat waves over North America. Climatic Change, 147(1-2), 165-178. Kominoski, J. S., Ruhí, A., Hagler, M. M., Petersen, K., Sabo, J. L., Sinha, T., et al. (2018). Patterns and drivers of fish extirpations in rivers of the American Southwest and Southeast. Glob Change Biol, 24(3), 1175-1185. Lopez, H., West, R., Dong, S., Goni, G., Kirtman, B., Lee, S. - K., et al. (2018). Early emergence of anthropogenically forced heat waves in the western United States and Great Lakes. Nature Climate Change, . Lu, Q., Chang, N. - B., Joyce, J., Chen, A. S., Savic, D. A., Djordjevic, S., et al. (2018). Exploring the potential climate change impact on urban growth in London by a cellular automata-based Markov chain model. Computers, Environment and Urban Systems, 68, 121-132. Mapes, B. E., Chung, E. S., Hannah, W. M., Masunaga, H., Wimmers, A. J., & Velden, C. S. (2018). The Meandering Margin of the Meteorological Moist Tropics. Geophys. Res. Lett., 45(2), 1177-1184. NeSmith, J. E., Alba, C., & Flory, S. L. (2018). Experimental drought and plant invasion additively suppress primary pine species of southeastern US forests. Forest Ecology and Management, 411, 158-165. Nowakowski, A. J., Watling, J. I., Thompson, M. E., ... Donnelly, M. A., et al. (2018). Thermal biology mediates responses of amphibians and reptiles to habitat modification. Ecol Lett, 21(3), 345-355. Panaou, T., Asefa, T., & Nachabe, M. H. (2018). Keeping Us Honest: Examining Climate States and Transition Probabilities of Precipitation Projections in General Circulation Models. Journal of Water Resources Planning and Management, 144(4). Perring, M. P., Bernhardt-Römermann, M., Baeten, L., ... Li, D., et al. (2018). Global environmental change effects on plant community composition trajectories depend upon management legacies. Glob Change Biol, 24(4), 1722-1740. Purkis, S. J. (2018). Remote Sensing Tropical Coral Reefs: The View from Above. Annu. Rev. Mar. Sci., 10(1), 149-168. Raczka, M. F., Bush, M. B., & De Oliveira, P. E. (2018). The collapse of megafaunal populations in southeastern Brazil. Quat. res., 89(01), 103-118. Rahman, M. A. (2018). Governance matters: climate change, corruption, and livelihoods in Bangladesh. Climatic Change, 147(1-2), 313-326. Romañach, S. S., DeAngelis, D. L., Koh, H. L., ... & Zhai, L. (2018). Conservation and restoration of mangroves: Global status, perspectives, and prognosis. Ocean & Coastal Management, 154, 72-82. Ryan, S., Stewart-Ibarra, A., Ordóñez-Enireb, E., ... James, T. G., et al. (2018). Spatiotemporal Variation in Environmental Vibrio cholerae in an Estuary in Southern Coastal Ecuador. International Journal of Environmental Research and Public Health, 15(3), 486. Scheffers, B. R., & Williams, S. E. (2018). Tropical mountain passes are out of reach - but not for arboreal species. Front Ecol Environ, 16(2), 101-108. Schiferl, J. D., Bush, M. B., Silman, M. R., & Urrego, D. H. (2018). Vegetation responses to late Holocene climate changes in an Andean forest. Quat. res., 89(01), 60-74. Sihi, D., Inglett, P. W., Gerber, S., & Inglett, K. S. (2018). Rate of warming affects temperature sensitivity of anaerobic peat decomposition and greenhouse gas production. Glob Change Biol, 24(1), e259-e274. Smeed, D. A., Josey, S. A., Beaulieu, C., Johns, W. E., Moat, B. I., Frajka-Williams, E., et al. (2018). The North Atlantic Ocean Is in a State of Reduced Overturning. Geophys. Res. Lett., 45(3), 1527-1533. Spezzaferri, S., El Kateb, A., Pisapia, C., & Hallock, P. (2018). In Situ Observations of Foraminiferal Bleaching in the Maldives, Indian Ocean. Journal of Foraminiferal Research, 48(1), 75-84. Thorslund, J., Jarsjo, J., Jaramillo, F., Jawitz, J. W., ... Cohen, M. J., et al. (2017). Wetlands as large-scale nature-based solutions: Status and challenges for research, engineering and management. Ecological Engineering, 108, 489-497. Timm, M. R., & Araújo, R. J. (2018). Comparisons of south Florida's seawall and natural mangrove stands reveal similar structural attributes. Urban Forestry & Urban Greening, 32, 7-20. Tracy, B. F., Foster, J. L., Butler, T. J., Islam, M. A., Toledo, D., & Vendramini, J. M. B. (2018). Resilience in Forage and Grazinglands. Crop Science, 58(1), 31. Tranmer, A. W., Marti, C. L., Tonina, D., ... & Imberger, J. (2018). A hierarchical modelling framework for assessing physical and biochemical characteristics of a regulated river. Ecological Modelling, 368, 78-93. Weatherhead, E. C., Wielicki, B. A., Ramaswamy, V., ... Soden, B., et al. (2018). Designing the Climate Observing System of the Future. Earth's Future, 6(1), 80-102. West, T. A. P., Grogan, K. A., Swisher, M. E., ... & Putz, F. E. (2018). A hybrid optimization-agent-based model of REDD+ payments to households on an old deforestation frontier in the Brazilian Amazon. Environmental Modelling & Software, 100, 159-174. Wing, A. A., Reed, K. A., Satoh, M., Stevens, B., Bony, S., & Ohno, T. (2018). Radiative-convective equilibrium model intercomparison project. Geosci. Model Dev., 11(2), 793-813. Wright, Z. A., Quinton, P. C., Martin, E. E., Leslie, S. A., MacLeod, K. G., & Herrmann, A. D. (2017). Neodymium isotope ratios and a positive delta C-13 excursion: interpreting the connection between oceanographic and climate changes during the early Late Ordovician of Laurentia. Stratigraphy, 14(1-4), 443-456. Yang, S. - H., Kang, N. - Y., Elsner, J. B., & Chun, Y. (2018). Influence of Global Warming on Western North Pacific Tropical Cyclone Intensities during 2015. J. Climate, 31(2), 919-925. Zhang, T., Niinemets, Ü., Sheffield, J., & Lichstein, J. W. (2018). Shifts in tree functional composition amplify the response of forest biomass to climate. Nature, .